As Bangkok is the most convenient international hub from which to fly to Bhutan, most people want to spend some time exploring the city. And there is plenty to keep you busy! On my trip to Bhutan to join our Hiking in the Peaceful Kingdom journey, I spent two days in Bangkok before meeting up with our group, and it was certainly helpful to acclimate to the time change and ensure that I had a buffer if my international flights were delayed. Here are a few suggestions for how you can spend your time. Day 1: Get your bearings and EAT! Go on a food tour. Bangkok is a foodie’s delight with amazing street food and traditional Thai cuisine, as well as Chinese- and Indian-influenced food. I chose the “Village of Love Daytime Food Tour” offered by Taste of Thailand—locals consider it one of the best areas in the city for food. Eight of us gathered at an elevated rail station (read more about this efficient, clean, cheap, and safe transit system) to meet our Thai guide. 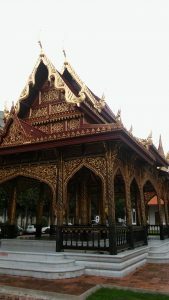 He explained that the nickname for this part of the city derived from the fact that Buddhists, Muslims, and Hindus have developed a community and lived together in peace for many years. 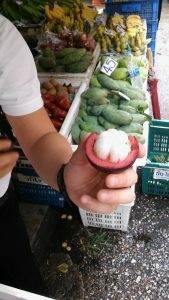 We walked around and sampled street food, traditional sweets from a famous local bakery, authentic Thai dishes, medicinal tea, real Thai tea (which isn’t as sweet as in the U.S.), and delicious native fruit I’d never seen before. It was very well-organized, the guide was knowledgeable and friendly, and by the end, we were all stuffed! WARNING: don’t eat a large breakfast before this. DON’T FORGET: tip your guide if he/she did well. The tour will end between 1:30 and 2, and you’re just a couple of rail stops from the main ferry ports for the river. Head there, get on the Tourist Boat, and make your way up to the Grand Palace. You can spend the rest of the afternoon at the palace complex—make sure you see the Reclining Buddha and Emerald Buddha, impressive for the size and artistry, respectively. The whole compound is a peaceful and green respite from the hustle and bustle of the surrounding city. 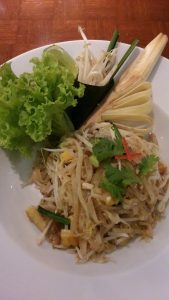 After a long, hot day of walking around the city, you may just want to head back to your air-conditioned hotel to eat—which is what I did, as the Novotel Hotel at the airport has fantastic food—I highly recommend the pad Thai. Or make sure you ask the reception for some recommendations downtown before you leave for the day. Now that you’ve got the hang of the rail system and the layout of the city, you can explore a bit. Walk around Chinatown or check out the weekend market if your stay coincides with a Saturday or Sunday. Google “Bangkok floating market tours” and you’ll find companies who can take you. Unfortunately, my stay was not over a weekend, but it’s on my list for next time! Definitely visit the Jim Thompson House, the home of an American who brought the Thai silk trade to the west and then mysteriously disappeared while hiking in Malaysia. You’ll learn about the process of gathering silk, weaving, and dying, and of course you can buy their beautiful products—but save room for Bhutanese crafts! If you’re up for something really off the beaten path, go to the Snake Farm at the Red Cross Institute. This is where they extract snake venom for labs to produce anti-venom. Watch as the workers “milk” the venom from the snakes’ fangs. Don’t forget the famous Thai massages. If you’ve never had one, they are quite an experience and very cheap. Many hotels have spas and massages, and you don’t even have to be a guest. 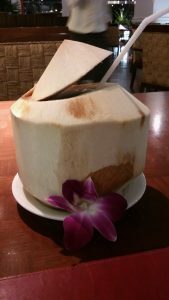 Try the Mandarin Oriental spa for a real treat, or the Novotel Hotel spa is an excellent choice and obviously very convenient if you are staying there. Have another day or looking for something active? There are a few companies that do cycling day tours. Unfortunately, I did not have time to partake in that. There are also several interesting Buddhist and Hindu temples scattered across the city. It’s fascinating to compare the Thai Buddhist temples with the Bhutanese temples. Overall, Bangkok was a fun and fascinating city to explore. 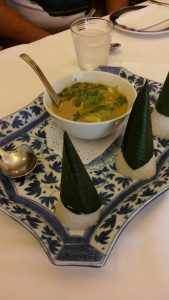 It’s very modern and international, while also offering a good introduction to Thai culture. That being said, the quiet calm of Bhutan was a lovely and welcome change.